Want to get a free copy of ‘Content Strategy for the Web’? Don’t get too excited, is not the entire Kristina Halvorson’s book, is just one of its chapters. Specifically Chapter 4: Audit; worth a read. As the author explains, Content Audit is not about listing URL’s and page titles, is about providing a great amount of useful, enlighten information that can be valuable. Many people skip this part, they think they know what content they have, missing the chance to tailor the information to record and meet their needs. 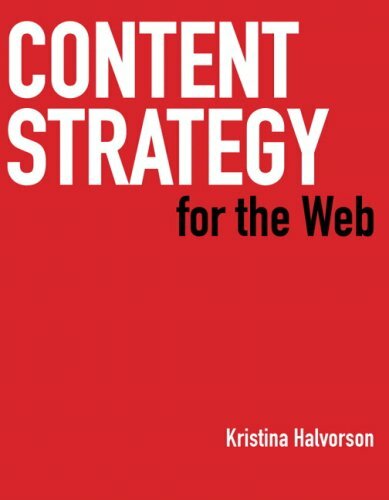 According to the website, Kristina Halvorson’s book ‘Content Strategy for the Web’ defines the discipline and business value of content strategy, offering simple steps for introducing the discipline into the web project process. It also gives practical advice on staffing and resource allocation for web editorial roles and responsibilities. The description sounds quite complex, the book the opposite. Basically, before brainstorming about what content you need, you have to understand what exactly you have, is just like a deep look at your fridge before going shopping. Caring about details, looking in all the cabinets and doing an inventory of the whole kitchen. Only by doing it you are going to know what exactly must be in the list, and what to cross in order to avoid getting stuff that you already have. I am wondering where does my content live? It has been here on the website the whole day resting, waiting to be read, or it is going somewhere, even faster, my thoughts are almost reaching you, trying to be shared and useful. Anyway, I am hungry so I will go and check the fridge. something completely, however this paragraph offers nice understanding yet.